This begins the second quarter of through the Bible lessons we taught for preschool. I help teach the 3 year olds on Wednesday nights. The first quarter was Genesis. We are going to talk about a baby named Moses. Amram was the father of Moses and Jochebed was his mother. Moses had a sister Miriam and an older brother named Aaron. Jochebed wanted to save baby Moses from Pharaoh who was the ruler in Egypt. Jochebed kept Moses hidden for 3 months, but then she couldn’t hide Moses anymore. He was getting bigger! So, Jochebed made a basket from the bulrushes. That is the tall grasses that grow by a river. 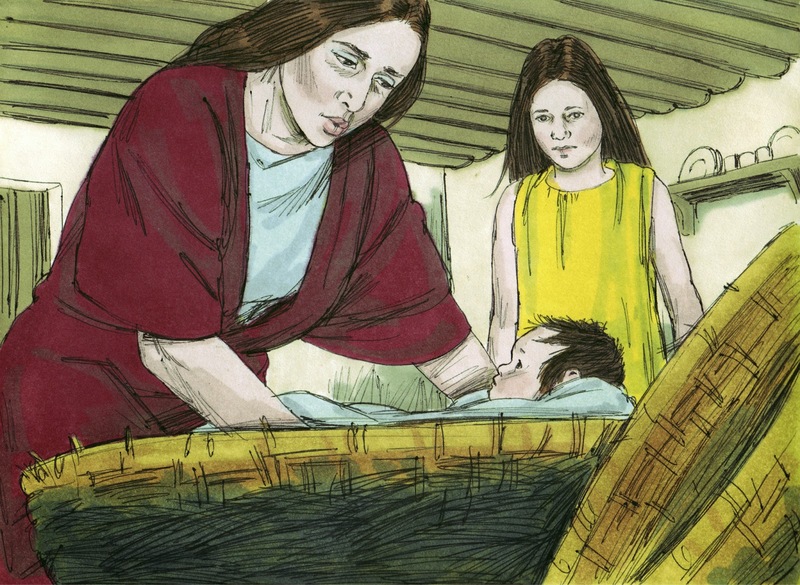 Jochebed put Moses in the basket and put the basket in the weeds on the bank of the river. 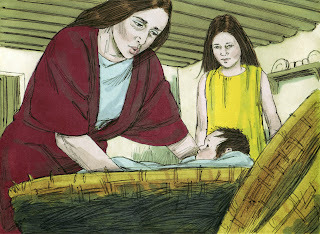 Jochebed told his sister Miriam to watch over Moses while he was in the basket. Pharaoh’s daughter came to the river to take a bath. She saw the basket floating in the river and sent one of her maids to get the basket. When the Pharaoh’s daughter opened the basket and saw the baby, she knew he was one of the Hebrew babies. I used this display for baby Moses. the background is a Tri-Fold board. Once the background was completed, I set it up on the floor. I love using Tri-Folds for visuals! They make a big impact, fold up flat and store easy. Click here to see more about this one and the directions to make your own. I used this updated Moses printable for the project. I print a color background for the teacher's visual, then black and white for the students to color. I printed Moses in the basket in color and prepared them before class. I glued ours to a large craft stick, which they love. Click here to download. More preschool ideas and printables for Moses that we did at home. M is for Moses and Miriam ideas and printables. Click here for lesson, printables and more for early elementary ages. This so reminded me of my years in SS as a child and the flannelgraphs, which I so loved! Super creativity in sharing God's Word with the next generation ... I'm with Joanne ... I remember those flannelgraph days move vividly than I'd like to admit!